A couple of Oakland fans plan on honoring the memory of Manti Te'o's dead, fake girlfriend by hanging this sign in O.co's Black Hole for tonight's game against San Diego (at 11:35 pm ET, remember). They will unfurl the sign at a very specific time—as Te'o and the Chargers take the field—so keep your eyes peeled. 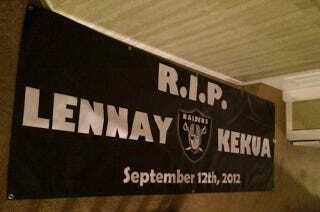 It has been nearly a year and one month since Lennay Kekua fake died/continued not existing.